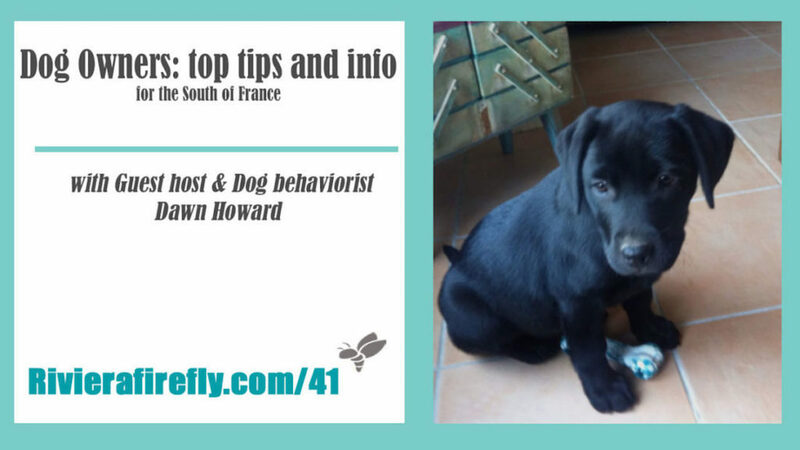 Dawn Howard -Dog behaviourist from Dogs D’azur is our guest host this week sharing dog car tips and essential info for the South of France. She shares her top tips for a happy dog. Here’s what you should be doing throughout the year to keep your dog in good shape. Keep in mind no one knows your dog like you do – so it’s important to keep an eye on them for signs of unusual behaviour and for any niggles go straight to your vet. You can buy a special toothbrush and toothpaste from your vet and it’s a great idea to start when they are puppies so they get used to it. Aim to do this once a week. Problem symptoms to look out for include: salivating or pawing at the mouth or signs of pain while chewing as well as bad breath. It’s a good idea to clean around your dog’s eyes regularly too ? how often will depend on breed. But for matted or sticky eyes or a foreign body ? a trip to the vet is essential. Regularly make sure nothing is lodged down there or that they are dirty. Again, this is one to start early, while they are young ? and your vet will love you as it will desensitize them. Symptoms include: shaking the head, or scratching, or a head tilt. How to move an injured dog. These guys operate a great scheme whereby you can take them all your small change ? get collecting today! And why not become a sponsor for one of the animals for just 10 euros per month. Firstly, make sure your dog gets the maximum amount of exercise. Join the conversation @The members-only Dogs D’azur Group for information, tips and advice on all things dog. The Riviera Firefly Podcast appreciates every contributor and listener ! Your comments, likes and shares make us really happy and inspire us to keep doing the shows! Come join us in our free community groups on Facebook: Côte d’Azur Living for all things South of France and for those running a business you need to join The Riviera Firefly Business Cocoon. It’s totally free! The costs of producing and hosting this podcast are funded by KidooLand ?. nicknamed by their clients “The Little English school” ? they organise Fun activities all in English for 0-16 year olds from baby clubs and playgroups, to English lessons and holiday camps they even hold workshops for adults too .. right here on the Cote d’Azur. So thanks for listening .. please do pay it forward and share an episode so we can spread the Cote d’Azur love. Until the next time Fireflies au revoir. We are thinking of getting a dog and this really helps!